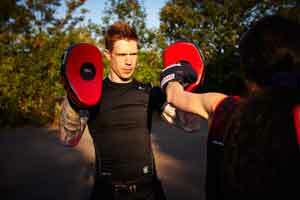 Boxing and MMA (mixed martial arts) training can be a great addition to your exercise routine. Suitable for both men and women, it is non contact, safe but hugely effective. It develops a lean, fit, strong physique and leaves you full of energy and endorphins. We can incorporate boxing or MMA training into your routines to blast body fat, burn huge amounts of calories and boost your fitness levels through intense interval training. You won’t be left on your own with a punchbag. Instead, I’ll work with you using pads and gloves to provide you with a fun, fast session which keeps you on your toes. Boxing and MMA sessions are short, simply because they’re hard work, and if done right, you shouldn’t be able to do it for long. We will tend to mix this type of training into a client’s routine. The training includes punching and kicking, using elbows and knees. In fact, with MMA training, you’ll be using your whole body. The core is incorporated in the twisting motions and your lower body gets a great workout. Needless to say, your upper body is worked hard too. Sessions are one-on-one, enabling us to keep a close eye on your technique at all times to ensure no injuries occur. We’ll bring all the necessary equipment, which may include boxing gloves, focus mitts, thai pads and hand wraps. It’s a safe, fun and really effective way to train. The physical results you’ll see from regular boxing sessions include weight loss, improved agility and co-ordination, you will get lean, defined muscles without bulk and amazing cardiovascular fitness. Mentally, boxing training lifts your mood, boosting your endorphin levels and giving you an outlet for any pent-up stress. Whilst we do cater for this type of training, Reboot Personal Training does not have any professional boxing or MMA coaches. Our version of this fantastic exercise is solely for overall fitness, therefore, if you are looking to improve your skills for actual competitive fights then you may want to look elsewhere. Want to Start Some Knock Out Training? Reboot Personal Training is here to help!